Put down the spray cans and pick up the sandblasters! DUFI are in the process of producing approx 30 stencilised quotes to be sandblasted into the streets of Inverness. 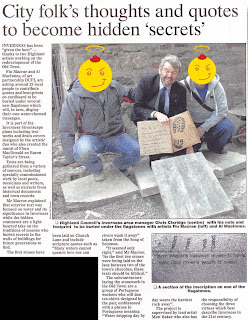 Here are some sample images, and a press cutting. PreviousPrevious post: Doctor, there’s something wrong with me. NextNext post:Bugs in my pockets, Bugs in my shoes.